Videos, worksheets, games and activities to help Algebra II students learn about combinations. C(n,r) represents the number of combinations of n items taken r at a time. 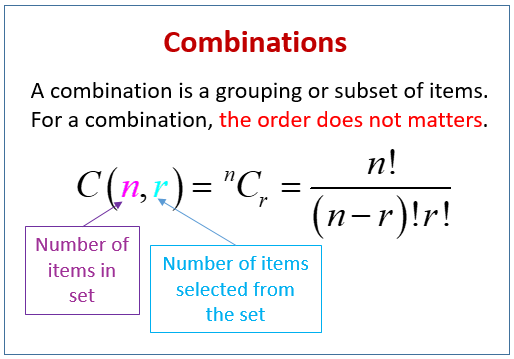 The following figure gives the formula to find the number of combinations of n items taken r at a time. Scroll down the page for more examples and solutions. How to evaluate a combination? How to use combinations to solve problems? This video introduces combinations and explains how to evaluate combinations as well as solve counting problems using combinations. Students learn that a combination is an arrangement of objects in which the order is not important.